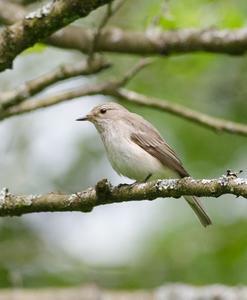 Larger than a Pied flycatcher, the Spotted flycatcher is grey-brown in colour with an off-white breast, streaked with darker grey and a streaked forehead. They like to perch and watch for passing insects, flying out to snap them up before returning to the perch. Their flycatching behaviour makes them easier to spot. They favour open areas amongst trees such as cemeteries, parks, woodland edges and glades. Look out for them in such areas throughout NPT. For more information see the RSPB Spotted flycatcher page.